A new book has been added to our lending library! Feel free to check out the book during peer support today, 5-7:30pm. In this astonishing and startling book, award-winning science and history writer Robert Whitaker investigates a medical mystery: Why has the number of disabled mentally ill in the United States tripled over the past two decades? Every day, 1,100 adults and children are added to the government disability rolls because they have become newly disabled by mental illness, with this epidemic spreading most rapidly among our nation’s children. What is going on? Then comes the scientific query at the heart of this book: During the past fifty years, when investigators looked at how psychiatric drugs affected long–term outcomes, what did they find? Did they discover that the drugs help people stay well? Function better? Enjoy good physical health? Or did they find that these medications, for some paradoxical reason,increase the likelihood that people will become chronically ill, less able to function well, more prone to physical illness? In this compelling history, Whitaker also tells the personal stories of children and adults swept up in this epidemic. Finally, he reports on innovative programs of psychiatric care in Europe and the United States that are producing good long-term outcomes. 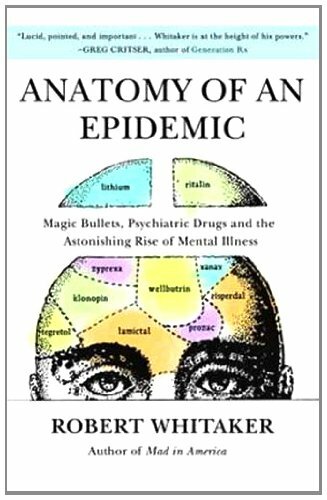 Our nation has been hit by an epidemic of disabling mental illness, and yet, as Anatomy of an Epidemicreveals, the medical blueprints for curbing that epidemic have already been drawn up.